The United States woke up to a turbulent Mother’s Day on May 10. A combination of weather events—hail, snow, flood, tornado and tropical storm—battered parts of central America and the coast of Carolina, requiring rescue efforts. According to a Reuters report, six people in Denton County, Texas, were pulled out of their homes that were inundated after heavy rain caused by thunderstorm. High winds toppled trees and floodwater swept away cars in other parts of Texas. There were, however, no injuries. “That is the most important thing,” Reuters quotes Sergeant Lonny Haschel of the Texas Highway Patrol as telling CNN. Residents of Delmont in eastern South Dakota were also being evacuated after the area was hit by a tornado, injuring nine and damaging about 20 buildings. “It’s a voluntary evacuation: there’s no water or electricity,” Tony Mangan, public information officer for the South Dakota Department of Public Safety, told Reuters. While no travel advisories were issued, officials issued a blizzard warning as all of South Dakota was blanketed in snow. The weather condition deteriorated by afternoon. 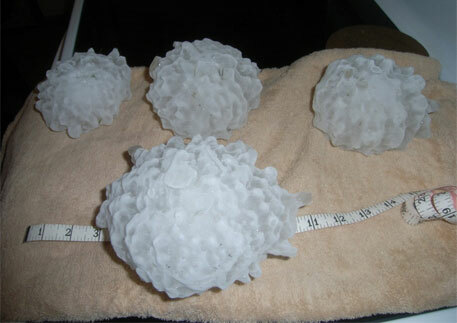 Severe thunderstorms developed over Sioux Falls, South Dakota, while Texas and Arakansas witnessed hailstorm. Tropical storm Ana made landfall near Myrtle Beach, South Carolina. Although the storm gradually weakened, flooding still threatened the coast.